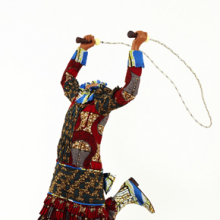 This figure was initially created as part of a larger installation, Mother and Father Worked Hard So I Can Play, which suggested the unruly behaviors of a class of Victorian-era individuals made wealthy, perhaps, through the economic exploitation of Africa. Shonibare often makes use of Dutch wax fabric—a commodity associated with Africa but actually created in Europe, based upon Indonesian designs, and sold in West Africa in the nineteenth century—as a symbol of the web of economic and racial interrelationships between Africa, Asia, and Europe. Figures such as this reveal “authenticity” as an illusion and evoke the layers of historical connections between global cultures. Gelede is a performance that often serves as a showcase for artistic innovation, with the forms of gelede masks depicting a wide range of motifs that are both entertaining and critical. 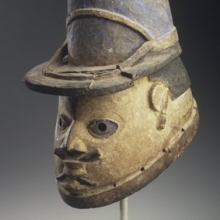 This mask depicts a French gendarme, a colonial soldier, and was likely performed as a critique of French personal and political behavior during the colonial period. 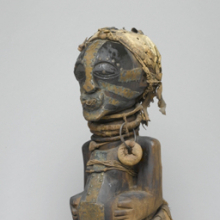 This Lulua maternity figure has a particularly ethereal delicacy and grace, and is considered to be one of the great masterpieces of African art. When a woman lost successive children through miscarriages or early infant death, the Lulua suspected ominous forces. 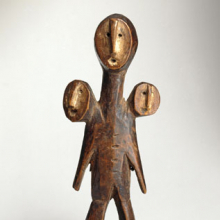 For assistance, she could be initiated into the Bwanga Bwa Cibola society, which used figures such as this one to offer protection through the intervention of spirits. Society members rubbed the figure daily with a mixture of oil and clay, giving it a glossy surface. While Western collectors value the visual impact of power figures, the ultimate importance of these sculptures to the Songye lies in their effectiveness as protectors of the community from malevolent forces and disease. 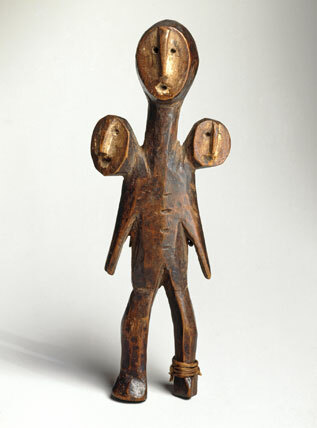 The power of such figures depends on their magical ingredients (bishimba), concealed in the abdominal cavity, in the top of the head, or in a horn set into the cranium (missing from this piece). These hidden substances acquire potency and interact with the spirit world when assembled according to a precise formula by the nganga, or ritual practitioner. This figure probably stood on an altar dedicated to a deceased king, or oba. His conical hat and elaborately wrapped kilt with a projection on the left side all indicate that this is a court official. The necklace of leopard’s teeth was worn only by warriors. 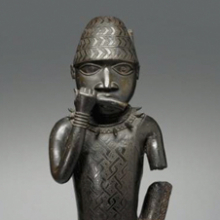 The horn this figure once held is believed to have been a type called an erere, blown during ceremonial sacrifices. 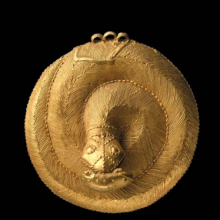 A motif on the figure’s kilt depicting an elephant, whose trunk ends in a human right hand, identifies this work with the reign of the oba Esigie, thought to have ruled from 1504 to 1550. A complete reinstallation of roughly 200 works from our world-renowned collection of African art, African Innovations is organized with a particular focus on the aesthetic, social, political, and cosmological problems addressed by African artists through their work. A dynamic and diverse range of objects that includes wood sculpture, metal casting, terracotta, textiles, and beadwork, African art has a long history of adaptation to and exchange with cultures near and far. Marking the first time that our African collection has been arranged chronologically, African Innovations invites you to examine the continent’s long record of artistic excellence, extending from ancient times through the present day. The installation stretches over some 2,500 years, from masterworks of ancient Nubia and Nok to contemporary pieces from the twenty-first century. Art from the nineteenth and early twentieth centuries, which comprises the majority of the collection, is considered according to five themes: protection, transitions, authority, masquerade, and personal beauty. A concluding section, our first dedicated space for contemporary African works, contains pieces by artists such as Viyé Diba, Magdalene Odundo, and Yinka Shonibare. Each of these artists claims a part in African art history while drawing on global perspectives—thus continuing the ongoing history of African innovation. African Innovations is organized by Kevin D. Dumouchelle, Assistant Curator, Arts of Africa and the Pacific Islands, Brooklyn Museum. Curator Kevin Dumouchelle and Chief Designer Matthew Yokobosky discuss the reinstallation of the Museum’s African collection.